After getting the back of the hand of Lenin's tomb, I realized I still had a ridiculous amount to see. 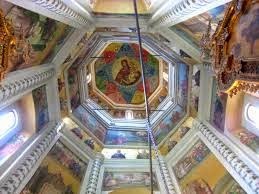 And I would start with the confection of St Basils. Walking up to St Basils for the first time for a travel-nutbag like me is one of those moments. You know, like when you first walk up to the Taj Mahal or the Great Wall or walk into your first pit toilet. I had little thrill tickles running up and down my neck. Here I was, actually standing in front of the iconic sherbert-flavored temple! The Cathedral of St Basil's is in a strange location: it just sits by itself, all alone, in the middle of the street. And it was so ... colorful and weird and swirly and different! How did this happy-happy joy-joy whimsy end up here, in the heart of stone-cold conservative Russia of all places?! St Basils, however, was way ahead of its time. 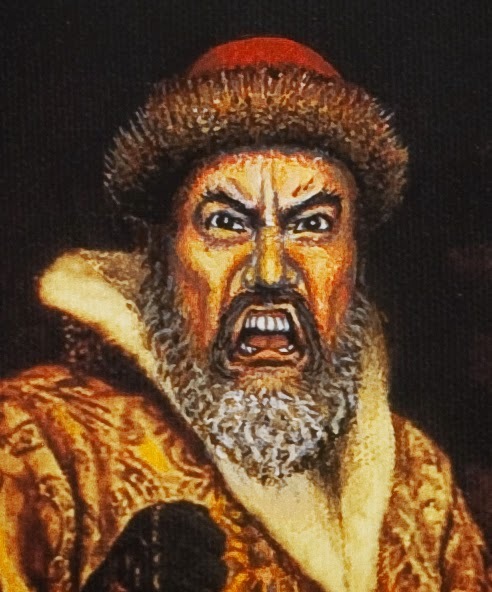 In fact, it was ordered under Ivan the Terrible back in 1551. The architecture was unlike anything before: a swirling multi-hued bonfire rising to the heavens. A history of Russian architecture by Shvidkovky gushes it has "... a strangeness that astonishes by its unexpectedness, complexity and dazzling interleaving of the manifold details of its design." I stared up the different colored onion bulbs and couldn't help but think of Willy Wonka. The first was undoubtedly green apple, the second blueberry cream, the 3rd, well, hmm.. maybe something that I coughed after my first taste of Russian herring. The cathedral is not one church, but 8 small churches around a central core. Wandering around these various rooms is interesting as each has a complete different personality. But nothing matches the absolutely stunning interior. There was the ornate iconostasis, the crayon-colored ceiling panels, and at the center of it all a Jesus looking benevolently from a red-blue-green starburst. 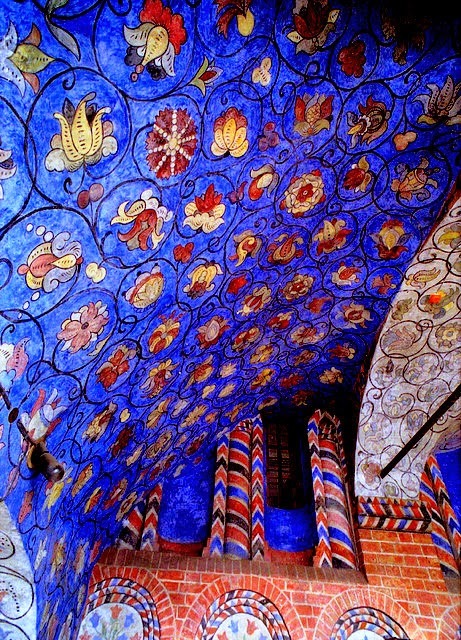 Perhaps the most interesting feature is the striking blue mosaics in the arches. It was all so very very different from the dark goth pointy churches of Europe. So refreshingly bright and welcoming! Once back outside, I found myself ambling around the church, marveling at it from all sides. From the south, the sun lit up the domes with a warm glow. This was the angle to take that postcard picture, and the crowds with their cameras ogling for a selfie agreed. It was on to the Kremlin itself. The word "Kremlin" actually means a fortified town center and many Russian cities have one. Of course, in Moscow the Kremlin is just a tad bigger. From Red Square you can see some golden domes atop something inside, teasing you with their sparkly bits. The red Kremlin walls are pleasant to walk around, surrounded by green lawns and flanked by the Moscow River. I really am not sure why on earth the Russian Tsars needed so many churches. There was the Cathedral of the Archangel, Cathedral of Bad Pronunciation, Cathedral of the Interesting Assumption, Church of the Deposition of the Robe, Church of the Putting the Robe on the Towel Rack Before Taking a Shower, Ivan's Bell Tower, my personal favorite The Church of Big Baby Jesus, and finally the Cathedral of the 12 Apostles Playing A Game of Cricket. I looked high and low for the Church of Twerking Angels but apparently that one is still under construction. Most of the main buildings are closed for government business, and it is pretty funny to see blacked out cars with blue flashing lights coming and going, just like in Beijing. Ah, if only I was an important official in an autocratic country! How awesome it would be to watch traffic melt to the sides as I, the great and important bureaucrat Nemo, proceeded! And so, after reveling in the Tsar riches of the Kremlin, it was off to see the real Moscow! More goodies await!